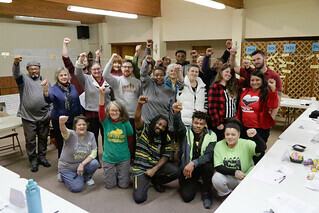 This weekend, KFTC's Voting Rights Strategy Team met in Frankfort with 27 members from all over the state coming together to lay a ground work for victories that will restore voting rights to Kentuckians who don't have the right to vote. True to our organizing values, many of the people attending have had their right to vote taken away and are fighting to get it back for themselves and the 312,000 other Kentuckians who can't vote now because of our regressive felony disenfranchisement laws. Kentucky is one of just two states in the U.S. now that take away voting rights from everyone with any kind of felony in their past for the rest of their life unless they can take the extraordinary step of getting their rights restored through a governor's pardon or expungement. Just last November, Florida 65% of voters approved a ballot amendment supporting the restoration of voting rights, inspiring many in Kentucky to believe more than a decade of effort may be closer to success.. It was an important space for the team members to get to know each other and root themselves in the many reasons why this issue is important to them – from a sense of fairness to a commitment to Democracy, a need to fight racism, or a faith that values redemption. Mostly people talked about the need to get justice for people with felonies in their past to vote because they're personally impacted – by having their own rights taken away or because they know and love someone who without the right to vote. Voting Rights Strategy Team members weighed various strategies moving forward including electoral work, litigation, helping people through the existing convoluted process, and more. We settled on a program of work that focuses long-term on a constitutional amendment that is the most permanent solution to restoring voting rights, but want to focus significantly on this year's governor's election, trying to make sure whoever wins this year's election is willing to restore voting rights with broad gubernatorial pardons (our current Governor Matt Bevin said he was strongly in favor of restoring voting rights as a candidate, but when he got into office, immediately removed a process put into place by Governor Beshear that made gubernatorial pardons easier to get). We laid out a 5-year plan, started a conversation about what allies to bring into the conversation and how, and laid out a basic calendar for the 2019 General Assembly, inviting people to come talk to legislators and build support around this issue. We also started a conversation about what other improvements are needed in Kentucky's Democracy, from longer voting hours to same-day-voter registration to voting by mail. Link to an album of pictures from the day.